Delhi Food Walks – Page 41 – Delhi Food. Redefined. The saddest comedy is that the very moment when the most hungry, groping our pockets for the precious medium of exchange brings upon this great realisation that reasonable price is the only way out of the crisis! Well, this is no problem in Delhi University, a magnificent hub of ‘running low on pockets’ youngsters. And it is actually a great excuse to be at the Ramjas canteen; a place that exudes a fine dine-in aura, but with food provided only till the college remains open and not quite reaching the dinner times. The college though the oldest in the University and established in 1917 and shifted to the present D.U. location in 1950, its canteen got the present and most evident form in 1999 only. So this high ceilinged hall with an official yellow tinge on its walls making space for several round tables with chairs around, a large delivery counter and a small but efficient accounts counter is quite modern. Bustling with the enthusiastic crowd of the institution, one is extremely glad on finding a wide range of food selects and an attendant to look after their requirements. For starters, a one food item that is of greatest popularity is the French fries. What is its speciality? These French fries will never fit into the conventional prototype of the food item but these potato slices, in their reddish-golden and crispy look and amazing taste will surely tickle your taste-buds. Next, the Rajma Chawal can be tried that melts extremely well in your mouth or even welcome the hot, crispy and golden discs of the Bhaturas that come with equally delectable Choles. The Pao Bhaji is another good option with its distinct taste and relishing freshness. Another food that stands out of its prototype is the ‘Pasta’ that has a flavour of Chinese delicacy. If sceptic, mark these words, one bite and you will yearn for more. Thirsty after so much of food, food and food? Well, choose the drink you might: fruit beer to fruit juice, shakes to the safe cold drinks, you find it all in an adjacent counter for drinks. The best thing about the Ramjas canteen is that the food is served in no time and also this place is hygiene friendly. Also, it is never conventional. Neither is it a boring, conventional college canteen, nor does it provide a conventional meal. In fact, some of its food items are so much out of the norm but yet are so exceptional that it blows one’s mind away. A word of advice: this place deserves a try. MY KIND OF GREAT FOOD! “ Eating food should be simple” is the motto of Ankit, the co-owner of a quaint little café in a lane in Kailash Colony Market called My Kind Of Street Cafe. Two years ago, it started in the serpentine lanes of Amar Colony Market, Lajpat Nagar IV, a favorite haunt of Lady Shri Ram College girls. It has been relocated to Kailash Colony to cater to the same. Their favorite item is the famous cheese momos.The cheese-filled dumplings dished out by them are a delight for any food lover. The love for this dish can be seen on the walls of the café, full of small notes plastered on the walls. Their smoken chicken white cream sauce pasta is also a delight. Another outlet of MKSC ,as it is fondly known as, is located in SDA market which mainly caters to the IITians right across the road. Their favorite is the Herb and Bacon Stuffed Chicken. A neat and complete platter completed with beans, broccoli, curd dip and garlic bread, healthy and delicious with a subtle flavor. Over the years, their food has evolved. The pasta, banana bread, my kind of burger, lemon butter fish are amongst the other mouth-watering delight the place has to offer. The menu has a lot of variety for people who like to experiment with food. It is a do-it-yourself menu so that one gets exactly what he has asked for. To end the wonderful experience, the banoffee pie is a must for the sweet toothed. It would be a shame to miss this stunner! On being asked about their future plans and prospects, Ankit shared a little secret. They plan to venture into the world of out-of-the-box South Indian food, which has already started functioning in the SDA outlet in a small way. With the way these two outstanding food joints are functioning, we can expect something really exciting in the days to come, and here’s wishing them all the best for a great future ahead and great and happy eating to all the young people in Delhi! Anil Tikki Wala, a newbie in the varied street food arena of Rohini, opened up last year amid huge competition prospects from its older counterparts in the area. But since its inception, it has managed to subdue all such uncertainties and has emerged as the favourite evening snack spots of the localites. Be it the chilling winter or the melting summer, nothing can stop the customers from hovering the orders over the ever-hardworking cooks. The prominent feature that emerges amid such rush and chaos, is their ability to maintain hygiene level at above-average standards. Olive oil is what they use for preparing the delicacies. 10 on 10 for their quality and hygiene maintenance. As the nomenclature depicts, ATW’s forte is the tikkis, chats and golgappas. But what has gravitated people’s attention is the exotic pav bhaji that they serve (beats everything). It is sure to give you the “food-erotica”. Other such dish that’ll gather your glimpse is the ‘veg kathi with rumali roti’. Slightly overpriced it is, but for a one-time go through, it is a yes-yes for sure. It has definitely given a hard time to its competitors in Rohini. The best time to visit this place is obviously the evening time with some of your best buddies where you can have the time of your life (tranquility at its best). So make sure you pay a visit to this small yet so classy food joint in Rohini. Finger-licking guaranteed…. CHEERS. Mamagoto. What a fun name! Its literal translation is ‘to play with food’; a Japanese social experiment of sorts, involving infants to use their senses to understand the textures and shape of food. Indeed, a playful atmosphere is created by the kaleidoscopic set of imagery that is omnipresent in the restaurant. The illustrations on the walls to the detailing on the cushions really set up a very young first impression in your mind, which is full of energy and enthusiasm. The range of colours used is very wide, yet it does not hurt the eye. Therefore the flamboyant ambience of the place is definitely its unique selling point and is worthy of a 9/10 rating. Seeing the paucity of authentic oriental cuisine restaurants, and exploiting the same as a lucrative opportunity, childhood friends, Kabir Suri and Rahul Khanna, the co-owners of Mamagoto, have made the idea become a real brand in no time. Mamagoto started its fruitful journey from its most popular branch located in Khan Market, in 2010, and has expanded since not just in NCR, but also has set foot in Mumbai. The restaurant was the first of its kind in terms of attractive and affordable destinations that could compete with the high-end long standing options of Taj and ITC Maurya. The menu is a fine blend of contemporary Thai and Japanese, with some original twists. Undoubtedly the best out of the four, it is an invention of Mamagoto. Its presentation is quite unique and the taste is unlike that of the standard desserts that are so popular in the market. Flakes of coconut whipped with lime, warm and crusty! The breakfast sugar seen in the corresponding picture has been removed from the dish now. Sourness and sweetness are balanced in an appropriate ratio, resulting in a one of its kind, pleasurable experience. The taste of coconut is carefully monitored, thereby preventing it from being overpowering. The outer layer is very crisp. Coconut flakes placed around the dish give it a beautiful appearance. It is definitely recommended to those who like to experiment with tastes. Peanut butter and brown sugar set with chocolate and cream. This dessert consists of 3 layers. The top layer is that of chocolate; the middle and bottom layers contain peanut butter, crackers, assorted butter, different types of cheese and almond essence. The bottom layer is harder and has a stronger flavour of peanut butter as compared to the middle one. Slicing the cheesecake vertically and then having it would make you realise how the taste of chocolate is lost, how it is engulfed in the peanut butter taste of the second and third layers, thereby making it almost non-existent. With consequent bites, the peanut butter taste grows stronger .All this results in a bit of disappointment for the customer as there’s not much speciality in this dessert for which he’ll be willing to pay about Rs 250. However peanut butter lovers will like this dessert for sure. As the name describes, the dessert is a blend of ingredients mingled in three layers, comprising of classic nutella hazelnut and chocolate sauce with biscuit crumbs and praline. Presented in a bowl, with nuts sprinkled on top, encompassing bifurcation of the three layers, easily visible to the eyes, the dessert tastes surprisingly salty in the first bite. However, as one moves on to finish the first layer, and pulls out a major chunk of the second layer, which is predominantly nutella, the dessert turns “too sweet” for the taste buds. The top most layer, boasting to be crunchy, loses its aura as it amalgamates with the nutella portion in the adjacent layer. But again, the astonishing part is the third layer, which also is in the same amount of contact with the second layer as the first one, remains as crunchy to the expectations of the brawling menu card. Having fiddled in with the intrinsic details of the constituents, the dessert includes within itself Amul milk chocolate, Philadelphia cheese, cracker, dry nuts and predominantly the before mentioned ingredients. . The dessert is undoubtedly a change from the routine affair that you’ll come across in various places, giving a somewhat justification to the unique conceptualized sweet eats, introduced by Mamagoto. However, if asked to choose among the four options when I visit again, this wouldn’t be topping my cloying craving, for the price portrayed doesn’t seem economical with the quantity offered. Soft, smooth and dwindling as you take a bite, within seconds, like a molten lava cake. Yes that’s the classic chocolate brownie winner for you! A necessity that every bakery showcases, this dessert is definite yes for those who like to play safe when it comes to relinquishing their taste buds. Chocolate brownie cake sprinkled with chocolate chips, is a classic favorite, enjoyed by all. However, to add a bit of difference to it, a scoop of ice cream, chocolate leaves (as portrayed in the picture) or whipped cream can be included. The price, being not justifiable to the quantity offered, could be reduced catering to the simplicity and normality in taste. Overall, the cake does taste flawless, if not flourless! Apart from the desserts, we also tasted few of their starters and mocktails. Both starters, Bite Size Corn Fritter Balls and Hot Basil Chicken Cups were a class apart. Hot Basil Chicken Cups is a masterpiece pulled off in a blend of lettuce, bird eye’s chili and crushed pepper, is a non-veg starter to die for. The decoration is beautiful and unique in the form of cups cut out of lettuce and stuffed with a delicious mix of the aforesaid ingredients, on the spicy side though, but with a unique crunchy feel to it. Bite Size Corn Fritter Balls, the vegetarian starter was an absolute delight, with the crisp outer layer of the corn balls and an array of droolworthy sauces/dips that came along with it. The quantity was good, more than what is normally expected of a starter. Our joy was further enhanced by the accompanying mocktails, ‘Kiwi+Mint Collins’ and ‘Watermelon Beach’, to name a couple. The colour of both the mocktails was gorgeous and very attractive. Refreshing, delicious and of suitable quantity, the mocktails are sure to leave you in a state of ecstasy. So Mamagoto is a fun place for sure; even though the desserts disappointed us at some level, the amazing starters and mocktails more than made up for them. They are going to launch 4 new desserts in the coming time and surely the launch is awaited by us! “Nothing ever tastes like the bhelpuri in Bombay” How many times have you heard someone say this to you? Well this is my mother’s favourite dialogue. But thanks to her love for the dish I discovered ‘Bombay Bhelpuri Wala’ in South Extension Part-1. Everyone who has ever lived in South Delhi knows that the one of the few places where one can find authentic Sevpuri / Bhelpuri is at this point. Selling out of a small cart in South Ex-1, Bombay Bhelpuri Wala has been in business for the last 15 years. Till this date it has retained its casino online old customers and continues to add on to its list. From my mom to my best friend’s mother, all recommend this point. What is so good about it you may ask? It could be the spicy ‘chatpatta panna’ of the Bhelpuri or the crispiness of the Sevpuri. The way all the flavours come together to create a beautiful concoction is amazing. My favourite is the Bhelpuri. The spice is just about right and the hint of a little sweet makes the bhelpuri perfect. Just like a boutique, you can always customize your dish to make it less spicy or tangier. The quantity is enough to fill your stomach but the taste is bound to make you ask for more! It may not look amazing or have the best ambience around but the Bombay bhelpuri Wala is definitely value for money. Just for Rs.50 per plate, the bhelpuri is bound to make your mouth water and your heart skip a beat with happiness. So all the complainers and the Bhelpuri lovers rush on down to South Ex Part-1 pronto! P.S- There is another Bombay Bhelpuri Wala in South Ex part2. Do not get confused. The Tibetan Refugee Camp near the Delhi University North campus is a paradise for every food enthusiast and adventurer. Situated on the Outer Ring Road, the entrance to the Camp is overbearing on no accounts and yet it opens up to you a small world so splendid and exquisite that you just don’t want to leave. The veritable ‘Mini Tibet’ is indeed what it claims to be: a small sample of Tibet. It showcases a convincing replica of authentic Tibetan food, culture and tradition. Besides the plethora of small cafes and cosy restaurants, one comes across many vendors in nooks and crannies of the Camps elling a Tibetan street food called Lhafin. A visit to Mini Tibet is incomplete without this dish which is sold at a very reasonable price of twenty five rupees. Majnu ka Tilla is probably the only place in Delhi where you will find this unique Tibetan dish. It comprises of thin cornflour rolls cut into thin slices resembling noodles, submerged in a delicious soup. The soup is a commensurate amalgamation of ginger water, soy sauce, vinegar, salt and a few spices and appeals most to those with a titillating tongue. It’s a rather entertaining experience to observe as the vendor takes out the cornflour roll from a big container, slices it up with fascinating dexterity, pours in various amounts of different spices and sauces and finally serves you the dish in a bowl with chopsticks or forks as per your choice. So come on out, experience Tibet in this bowlful of delectable flavours amidst an ambience of Buddhist chants and an omnipresent decoration of “Free Tibet” posters and wall graffiti. English. Exquisite. Elegant .Exclusive. 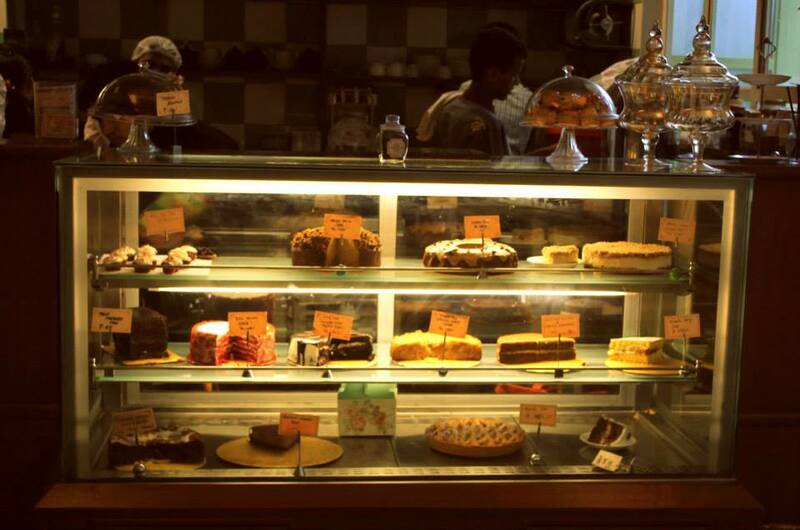 Expensive.Combining all of that, you get Elma’s cafe, a cosy cafe in the streets of Hauz Khas Village. So here I was with two other friends, out to review the place that is very popular among the food joints in HKV. Entering the place, you notice the beautiful and delicate ambience, made complete with floral prints on the drapes and curtains, cupboards with old cups and plates, a piano and a quiet view of the deer park. The bakery items on display are so amazing to look at, that customers sometimes sit for long durations of time, just gazing at the display! Cooks working in the open kitchen constitute another view that is enjoyed by visitors. However the seating is very limited , since it’s a small cafe. Talking to the owner, we got to know that her son started TLR cafe, another food joint in HKV. Since the quality of the outsourced breads was not satisfactory, she decided to open a bakery of her own that would provide good quality bread. This and the fact that coffee could be found everywhere but different types of teas were difficult to find, she being a tea person, established Elma’s.Here’s a fun fact for those of you who didn’t know: Elma is the name of the family dog and Edward is the family cat! Edward’s is on the ground floor and Elma’s is on the 1st. They share the same menu. The famous desserts of the place such as the Red Velvet Cake and Moist Chocolate Cake are absolutely fabulous but we wanted to try new items, so here they are. Let’s begin with Nilgiri Frost, a favourite of the owner too. It’s a lighter colour than Earl’s Grey, the taste is just right, neither too strong nor too mild. The cup is very aromatic and it goes well with heavy cakes. It tastes best without milk. The next tea we tasted was Earl’s Grey, which was again very aromatic but was a darker colour. It was stronger than Nilgiri Frost. Both of them were very typical teas and must be tried by tea lovers for sure. Apart from this, the Belgian Chocolate shake was amazing too, rich in chocolate and pleasure! The freshly-made scones with the great texture, accompanied by pure fruit jam and cream were a delight to our taste buds.The apple pie was perfectly made, with a very crisp outer layer and the handmade pattern on top. The taste of apple was very subtle. Mac and Cheese was beautifully baked. The three neat, distinct layers were as follows: a crisp layer of bread crumbs on top, followed by a delicious cheese layer and then the macaroni. It was quite filling. Lastly, we had the healthy ‘lean and green sandwich’, which had Elma’s slow roasted tomatoes on a bed of lettuce and rocket leaves drizzled with extra virgin olive oil. It is very apt for a light breakfast, the taste is not overpowering. Indulging in the quaint atmosphere of the place, one understands how this place attracts people who prefer boutiques over malls, who are not mere customers but are food enthusiasts, who are willing to pay a bit extra for something special. So if you enjoy the finer things in life, try out this place for sure! It’s not just about the crowded narrow lanes, the old havelis, nor the Red Fort, but it is so much more than all this. Old Delhi appeals many not only because of the above stated reasons among others, but because of the old world charm it still manages to hold. Purani Dilli is like a crowd-puller which calls people even from far off places. It is a hub of so many cultures, traditions, cuisines and has something for each one. It is most famous for its street food and welcomes everyone who wants to taste the traditional Indian food in desi style! Where else will it be considered a disgrace to have Pani Puri with mineral water and in an air- conditioned restaurant but in Old Delhi? It knows that Pani Puri tastes the best on roadside! One of the best things about Old Delhi is its flavour. If you really want to taste was an actual plate of Dahi Bhalla or sewaiyyon ka halwa tastes like, Purani Dilli is the place. It has handled the flavours very well and still manages to keep them intact in the dish. I recommend you treat your taste buds here at least once! There is a lot that Old Delhi offers. After one hectic day, even I set out to satisfy my hunger along with a friend of mine who had never been to the ever glorified Chandni Chowk. We preferred to stroll in the lanes so we could explore more and after quiet a long walk, we landed ourselves in one of the most popular restaurants in Old Delhi, Shiv Mishthan Bhandar. If you go from Red Fort towards Fatehpuri, it’s located in the end at the right side, near Bikanerwala. We went through the menu after being warmly welcomed by the owner, Raja Bhai. Since he told us that Bedmi Puri is the most popular dish, we ordered the same. We also ordered Chole Bhature. The service was pretty good and the food was served hot and in very little time. Hungry as we always are, we smacked the food. Honestly speaking, the puri was a hit. It was hot, crispy and perfectly fried. This hearty dish is fried puffed bread with a mix of lentils and spices. Urad Dal is the main addition to the puri which also makes the texture a little granulated. It is crispier than the normal puri. Some people also add ‘hing’ to the puri for flavour. The red chilli added to the pitthi of Urad dal makes the puri spicy. I would give 8/10 to the puri but only 6/10 to the subzi, since it wasn’t that scrumptious. Salt was in excess in the subzi and it was not even prepared very well. Overall I would rate the dish at 7/10. After finishing the puri subzi, we dipped our fingers in the chole bhature, which was a better option than the puri subzi, simply because both the bhature and the chole were perfectly made. The bhature were golden brown and and the chole were aptly spiced. The mango pickle with the chole was a great addition. Chole Bhature would get 8/10 from me. After the enjoyable lunch, we ordered imartis. They are quite similar to jalebis but not totally. Imarti is made from a variety of urad flour and deep fried in a circular shape. Saffron is also added for colour and afterwards it is dipped in sugar syrup. They are usually yellow- orange in colour due to the saffron. Perfectly crisp and sweetened imartis put an end to our foodelicious journey. Shiv Mishthan offers a fairly large variety of Indian snacks and dishes at quite reasonable prices. The owner, Raja Bhai told us that they cater around 500 people daily and Bedmi Puri is a favourite with all. Hope you grab of the same too! Address- 375, Kucha Ghasi Ram, Chandni Chowk, Delhi- 110006. When was the last time you stepped out of the car just to spend some time out of your busy life savouring roadside flavours of chaat? Well it shouldn’t be hard remembering if you have Bobby Tikki wala in your vicinity. Situated in the hub of Preet vihar (east delhi), the very promising bobby Tikki (popularly called) offers Chat Papri, Mouth Watering Golgappe (Pani Puri), scrumptious Aloo ki Tikki, Mumbai’s Pav Bhaji, etc. which treats everyone”s taste buds really well. Calling himself a chaat specialist, its owner Mr. Bobby Gupta, takes special interest in explaining his vision to us behind starting up his own range of shudh vegetarian food prepared in pure desi ghee and typical old Delhi”s Chat. He strongly believes that ‘food should not only fill a man’s stomach, it should satisfy his soul and cheer up his heart!’ And with that he treats me with two scrumptious dishes, both being their specialities, the very famous Aloo ki Tikki (must have!) and the irresistible Gol gappe. Needless to mention, he surely kept up to his words. Extending its boundaries, Bobby Tikki wala has also made a mark for itself in the catering circle of Delhi & NCR. They offer a large Subscribe to: Most Wished For > buy-detox.com/shop/urine-drug-test-detox-pills & Cleansing DietsAfter viewing product detail pages, look here to find an easy way to navigate back to pages you are interested in. range of menus to suit every taste and budget. However, they offer custom-made menus too. For, when it comes to catering they believe that your event is as important to them as it is to you. Aloo ki Tikki, Papdi chaat, bhalla papdi, Stuffed gol gappe, pani puri, Mumbai’s pav bhaji, Raj kachori, Veg kathi kabab with roomali roti and more. Nonetheless their prices are very reasonable and they even offer their freshly prepared food through free home delivery up to 2 km. So, if you wish to have a snack but strictly on the streets then this is surely the place to be in. Are you among those who are obsessed about maggi? If your staple food during school was maggi then “FYI! IT” MAGGI” is just the right place for you. Situated at Bungalow Road, FYI is the latest addition to the scores of popular Maggi points situated in North Campus, Delhi University. This cozy little maggi lounge with its bright yellow and red walls, low height tables placed on dices is not only visually appealing but also the coolest place to hangout with friends. FYI has not only added new flavours to maggi but has given it a whole new meaning. It offers maggi in 15 different avatars each accompanied online casinos by whacky names such as LOL, OMG, BRB, TTYL, WTF etc. WTF is a crispy, crunchy chinese bhel a treat for your taste buds.OMG! Is a creamy, saucy, cheesy pasta a must have for all the pasta lovers. But the king of all avatars of maggi is PS*(a platter of tangy maggi kebabs. Post script: You”ll love it). Crispy on the outside and spicy, juicy and tasty on the inside…this yummy kebab will linger in your mouth even after you have taken the last place and will leave you craving for more. The pricing has been done keeping in mind the college crowd so the food is available for as low as Rs.25 to highest of Rs.65, so it does help reduce the guilt of consuming so many calories.